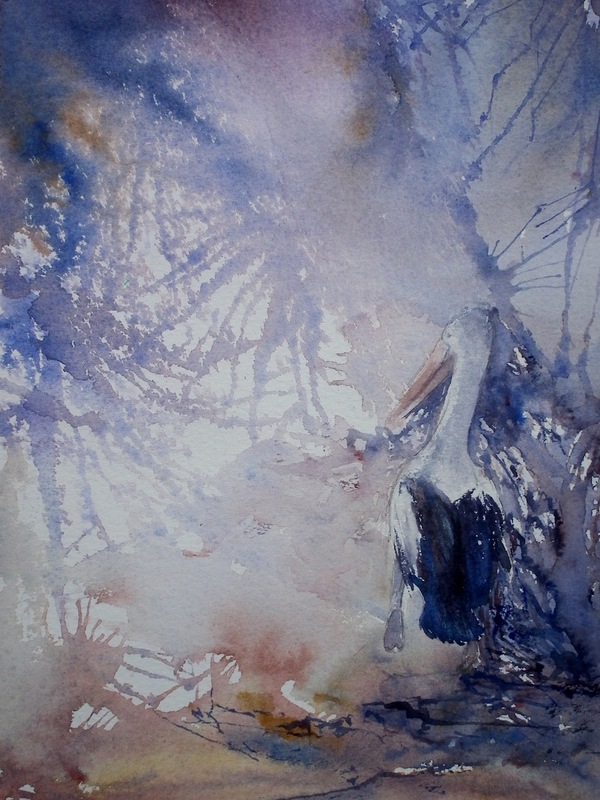 Last night I came across this photo of a watercolour of a pelican which I did a year or so ago using the same process mentioned in the previous post. This one sold rather quickly but I had intended to do a seies of birds in this manner. As often happens other things took over. Maybe this time if I find a good, appropriate place to have an exhibition I will be inspired to produce a collection of these. I do so enjoy the process and the bit of mystery and movement of the end result. Satisfies both my love of careful rendition and drawing…. my Science/Biology background…. and my love of playing with paint effects in a fluid and creative manner…. my “wild”, emotional art side. This entry was posted in All things Coastal, art, painting, Tasmanian artists, watercolour and tagged birds, blowing paint, Contemporary art, creative watercolour, lost and found edges in painting, movement in watercolour, mystery in watercolour, nature, paint tangles, painting atmosphere, painting movement, painting mystery, painting nature, Pelican, play with paint, Tasmanian art, watercolour.